Scroll down to see our selection of playing cards and accessories for sale. Playing cards and accessories are used by individuals or groups for entertainment. 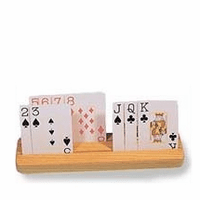 We carry a variety of playing cards and accessories for sale including large face playing cards, wooden card holders, free standing card holders and automatic card shufflers. What are playing cards and accessories? Playing cards and their accessories are items used for entertainment in assisted living facilities or at home. Play card accessories, like card holders make holding and viewing the cards easier for elderly or disable persons with limited hand strength. For this same reason, automatic card shufflers are helpful and neatly stack the cards in random order. When eye sight is weak, large face playing cards are easier to see reducing eye strain and increasing your chances of winning. Make the game fair with playing cards and their accessories.